Overwatch has confirmed another LGBTQ character on its roster, and its probably the last person you’d expect to come out: Soldier 76. That’s right! In the latest Overwatch short story, called “Bastet,” we’re introduced to a new character named Vincent. 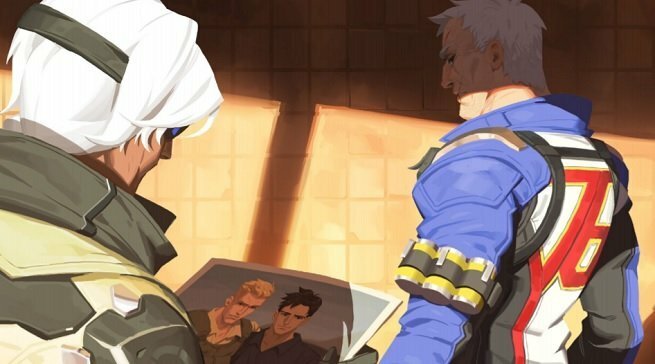 In a past life, Vincent and Jack (Soldier 76) were in a relationship, but 76 knew that his duties to Overwatch would never allow him to give Vincent the life he thought that he deserved. You can check out the entire comic right here. Below, we’ve pasted the relevant bit. Ana is holding a photograph of Jack and Vincent, and is questioning Jack about whether or not he misses his old friend. It was the other person in the picture that surprised her – a dark-haired man, dressed in a casual, black button up shirt. Jack’s arm was around his shoulder. Ana was unconvinced. In the early days, Jack talked about him often, floating a dream that the war would end quickly, and maybe he’d have a chance to return to a normal life. But a normal life was never the reward for people like us. Soldier 76 joins Tracer as the second openly-gay character on the Overwatch roster. Blizzard has affirmed its commitment to diverse representation in its monstrously-popular game, so expect to see more additions to the most badass LGBTQ community around soon.